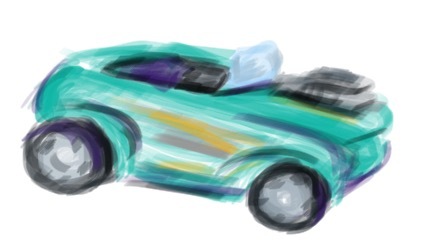 I have been using Wacom drawing tablets for about twenty years. Through personal purchases, employees, and MyMac reviews I have tried everything from their pro line to their consumer line. Throughout that time period I have never been disappointed. The tablets keep getting better and better. The new Intous Draw is part of the new Intuos consumer lineup made up of four models. The Draw is the least expensive at $69.95. Will this meet my expectations from all of the previous tablets? First, the tablet looks great. 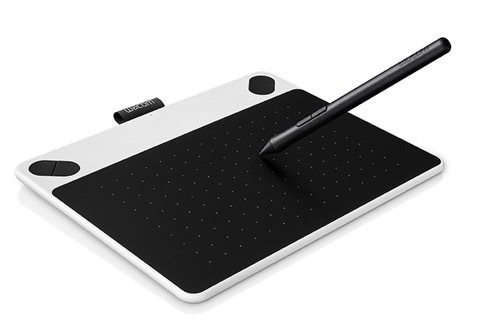 Once again, Wacom has redesigned the look of their tablets and these look fantastic. The Draw comes in white and blue. I was sent the white model for evaluation. It has a white border with four programmable buttons on the top, with a 6″ x 3.7” drawing area underneath. I really like the position of the buttons on this tablet. They are easily accessible when using the tablet without having to do much maneuvering and repositioning. The USB cable plugs into the back and is out of the way, and plenty long (a wireless kit is available). It also has a sleeve to slide the pen into. It is also extremely thin and light. The pen also has two programmable buttons. You can set them for key commands or preprogrammed settings via the System Preference that is installed when you install the drivers. Speaking of drivers, I highly recommend you visit the Wacom support site to download the latest drivers. The box does have a CD with drivers on it, but the site has the latest version. As for performance, the tablet works great. The small size might scare off some users, but I have never had a problem working with a smaller tablet. The drawing area mirrors the screen space, so once you get used to using a tablet your mind adjusts to what is on the screen and not how big or small the tablet is. The pen has 1024 levels of pressure sensitivity, which is plenty for most users. Drawing in programs that use pressure sensitivity is a pleasure. You press harder and you get a darker mark, softer and you get a lighter mark. 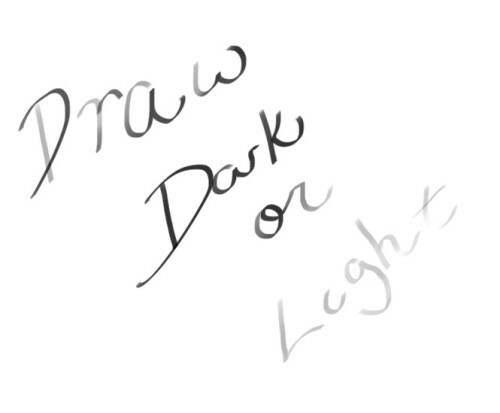 You can easily get the feel of a traditional tool with shading and light and dark marks. Do you get more levels of sensitivity with a pro model? Yes, but most users will not need it. Even a professional on a budget will be happy with this tablet. I also like the feel of the pen on the tablet. It is not a smooth finish allowing the pen to slip and slide all over the place. It has a touch of friction between pen and tablet making it feel more like drawing on a paper with slight tooth. As usual with Wacom, the tablet also comes with software. The Draw comes with ArtRage Lite (download), an 8″ X 10″ metal print, and a thirty day membership to lynda.com. At about $70, the new Intuos Draw is perfect for classrooms, students, teachers, and like I said earlier, even pros who don’t want to spend a lot of money. As a teacher and a part-time professional I would have no problem using this tablet as my everyday tablet or as a tablet in my classroom. If you are in the market for a great tablet that will not break your budget, this is the tablet to get. MyMac.com review rating is perfect 10 out of 10.